I am not sure if I have become more adventurous as I get older or if it has always been there and I just didn’t act on it as much. This morning I have been putting together the details of my next big adventure and this part is always so exciting and fun. I am visionary and love to dream, and dream big. When it comes time to live out the adventure it gets much more challenging. I really want to do these things, but if I were completely honest, I am scared. Packing is one of the hardest things and I leave it to the very last minute. Packing means this is real. I have had an anxiety attack once on the way to the airport. I have never had one before, or since then. I think the more I ignore my fears and go anyways, the easier it gets. At least that’s what I am hoping! I sometimes feel like people think I am so brave but really if that’s true it’s not because of a lack of fear. I am scared of all kinds of things, I just don’t make decisions based on those fears. Do you know people who do? I do, and I think they are very nice people, but I don’t want to be like them. They get trapped and never learn, never grow and never experience new things. They never challenge themselves. I can think of so many things I would have missed if I had listened to my fears instead of ignoring them. Don’t get me wrong it’s really awful to walk through it, but the other side is worth it. Maybe it helps that I can’t let my fears show most of the time because it’s just my kids and I. I need to be strong and appear fearless when we hit turbulence on a flight – they need to be assured everything will be ok even though my guts are turning inside out. Did I mention I hate flying? Oh, I HATE flying. This doesn’t mean I am fake with my kids but there are times when they need to feel confident in me and so we talk about how scary that was after the incident is behind us. The adventures seem to keep getting bigger each time. 2016 I plan to actually fly over an ocean, which has been a fear of mine for a very long time. 2015 is a bit of a precursor for that, though I am still remaining on our continent. There is so much to see and do in this world and we have such a short life. I can’t even begin to do a small fraction of it all or see it all, but I want to do what I can. I think it boils down to three kinds of people: Those who are scared to do things and don’t, those who are scared to do things and do it anyways, and those who have done it so much they aren’t cared anymore. I am working my way to the third category one fear at a time. 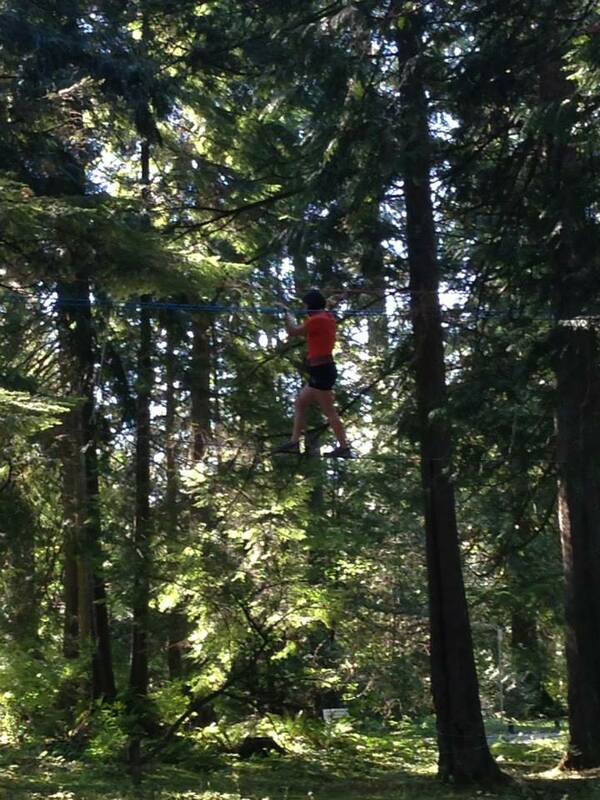 Yes that is actually me in a harness extremely high in the trees on a single wire. Not my favorite experience.